Ford has confirmed the four drivers that will take part in its full-season FIA World Endurance Championship effort, naming Andy Priaulx, Stefan Muecke, Olivier Pla and Marino Franchitti as Ford Chip Ganassi Racing pilots in 2016. The quartet of drivers were revealed Tuesday during the launch of the team’s European-based operations in Greatworth Park, England. The Multimatic-run factory GTE-Pro class effort joins the U.S.-based Ganassi IMSA WeatherTech SportsCar Championship operation in the Blue Oval’s global program with the new mid-engined supercar. “Make no mistake, we are racing to win,” said Dave Pericak, Ford Performance global director. Priaulx joins Ford following a successful 13-year stint with BMW, which saw the British driver claim three consecutive FIA WTCC titles, victory in the Nurburgring 24, as well as wins in both the American and European Le Mans Series. The 41-year-old will kick off his 2016 season later this month in one of Ganassi’s Ford EcoBoost-powered Riley DPs, prior to a focus on the nine-round WEC season. 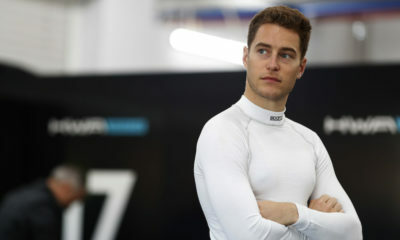 “A new project is always exciting but for me to be driving for Ford in the WEC is just on another level,” Priaulx said. “I can’t wait to get behind the wheel of the car and start the preparations for the season. “Any motorsport fan will remember the iconic Ford GT40 cars of the past, and for me to be part of this program 50 years after Ford’s historic win at Le Mans is such a privilege. Muecke, meanwhile, will also be in Daytona, as a third driver in the No. 67 Ford GT in the car’s debut race. The former Aston Martin Racing factory driver brings four years of WEC experience to the new operation. Frenchman Pla is also a WEC veteran, but moves from prototype ranks after being a part of Nissan’s now-defunct LMP1 program. The 34-year-old earned a season-high four LMP2 class wins in 2014 with G-Drive Racing. Although no stranger to the Ganassi organization, Franchitti will take on the globe-trotting championship for the first time. The Scot also returns to his GT racing roots in 2016 after having achieved success in prototype machinery, primarily in the U.S., including helping deliver the first win for the Ford-powered Riley DP at the Twelve Hours of Sebring in 2014. “From my first test in the Ford GT I fell in love with it and just wanted to drive it more and more,” Franchitti said. Driver pairings for the WEC effort have yet to be announced. Both of the full-season WEC cars will have automatic entries to the 24 Hours of Le Mans, with Ford seeking two additional entries for this year’s French endurance classic, which marks the 50th anniversary of its first overall win in 1966. It currently has announced eight total drivers, with Sebastien Bourdais, who is listed in the No. 66 car for Daytona — and most likely the remaining Tequila Patron North American Endurance Cup rounds — being the ninth driver overall.